WRITING FROM PGA VILLAGE in Port St. Lucie Florida. No the weather has not been great, but it sure beat’s being at home. But the Gog Blog after some 24 days on the road, heads back to the home base this weekend. Please clear all the roads of snow, and get the temps back to at least 30 degrees. For the most part, I have not seen a lot of sun, or played much of my golf in temperatures of at least 60 degrees. It’s been a lot of 35-55 degree golf, but I’m playing at that is something in itself. After being sidelined last year with limited vision before my eye surgeries, the rounds were down, and I’m planning on not letting that happen again. After attending the 2019 PGA Merchandise Show, I am really fired up to play more this year, and revamp my bag with new clubs. On the club side there is plenty to be excited about, and much to like in the lines of new clubs. Including what’s coming out from our local equipment suppliers, Wilson Golf, and Tour Edge Golf. 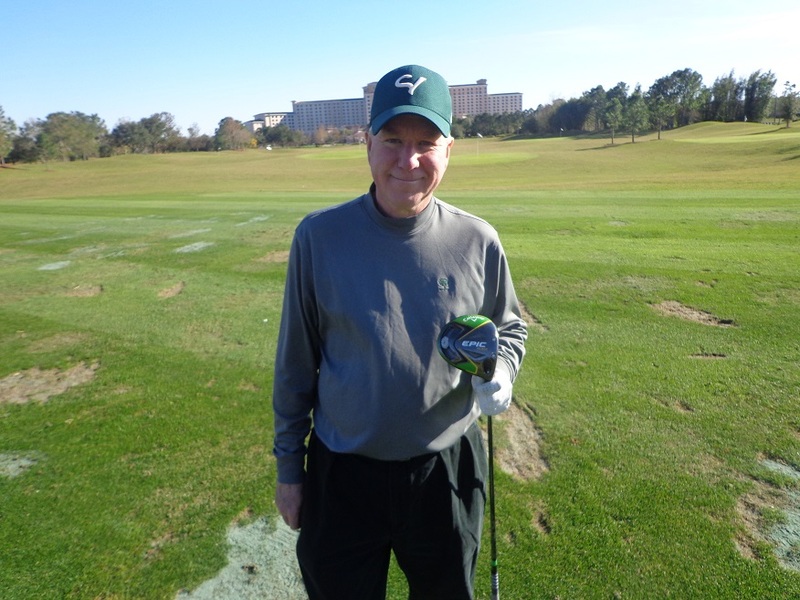 THE NEW EPIC FLASH DRIVER by Callaway, on the range at the Brad Brewer Academy in Orlando Florida. On the driver front, I’m not sure there has been a year in recent memory to go get a new driver. The is a huge buzz around the new Callaway Epic Flash driver, it has what golfers are looking for and that is more speed. It has a good feel and the ball is jumping off the face, if your buying a driver in 2019, do check out the Epic Flash before you make a decision. But great drivers don’t stop there, Evan Hoffman’s Cortex the winner of Wilson Golf’s Driver vs Driver 2 program, has created a solid driver that will send your golf ball flying down the fairway. I hit the Cortex finally, at the end of the show and came away very impressed, and apparently so are golfers. The initial run of Cortex drivers made by Wilson has already sold out, and more are being built. Just to bounce off drivers for a second here, I spoke with Ryan First the Wilson Golf Territory Manager who got me to try the new Wilson D7’s Irons, and they have a great feel to them, the weighting seems like they not leave you with stinging hands after hitting shots on the cold days. For those of you in need of new Irons this summer, take a look at the D700’s before you make a decision. Evan Hoffman the designer of the Wilson Cortex Driver, has much to be smiling about these days, after winning Driver vs Driver 2. Batavia based Tour Edge Golf is on the move as well. Their line of Exotics is gaining in the the market, and a line of six champions tour players are now endorsing their product. The Tour Edge Tour Exotic EXS Drivers are solid. 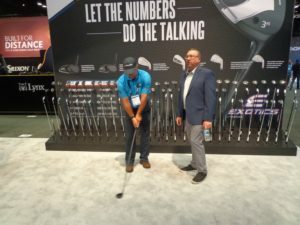 Champions Tour leaders like Scott McCarron, Tom Lehman, Duffy Waldorf and Rocco Mediate are all endorsing Tour Edge, whose new product is catching the eyes of golfers and not just on the PGA Champions Tour. If you are looking at new products in your golf bag this summer, don’t be afraid to check out the local golf companies from the Chicago area both Tour Edge and Wilson. Both companies are making very good clubs, that golfers of all levels should be looking into. Both Titleist and Callaway have made improvements to their golf balls. For Titleist the Pro V1 and Pro V1x have been improved, and the new Callaway Soft ERC golf balls do fly well, and I found out they were a good ball when being used in 30-40 degree weather. 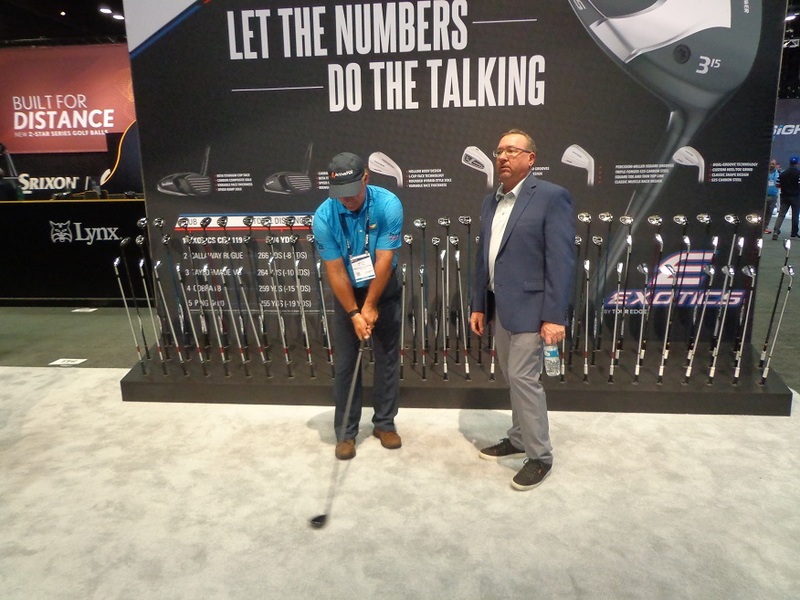 Champions Tour Player Scott McCarron with Tour Edge President David Glod look at the new Tour Edge Exotics at the PGA Show. What else jumped out at the show. The presence of both Top Golf and Toptracer, and I will have more on that here in the days ahead, and in the first issue of Chicagoland Golf, that appears at the Chicago Golf Show late February in Rosemont. The only winter golf show in town this year, with both the Lake County and Tinley Park Shows being cancelled. 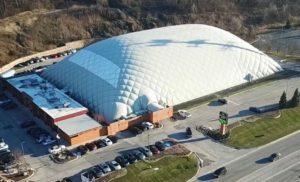 TopGolf had major convention floor and demo day space, their new facility in the Chicago area, will open in Schaumburg late this summer. Golf shoes, they keep getting better and better every year. FootJoy, Callaway, Adidas and New Balance had new shoes out this year. Shoes with more comfort added protection on the area’s that wear the most, shoes that will keep your feet dryer when needed on wet days. New Balance has really created a new shoe golf shoe line, after being the shoe for years for runners, and marathon runners. With several equipment companies making returns to the show this year, or adding floor space, I don’t think that TaylorMade was missed all that much. If I’m a TM staff professional, I have to question why. Rumor was that TM will release new products later this year, and their presence at the show could cause informational leaks about what they have in the drawing board. If you want to believe that. The apparel companies all had some interesting product designs for the spring and summer ahead, I have a story with Antigua and Greg Norman apparel lines coming up. Oak Brook Terrace base Zero-Friction has some great new golf gloves and is continuing to make progress in the section of the market, also check out their colored golf balls and various tee models. 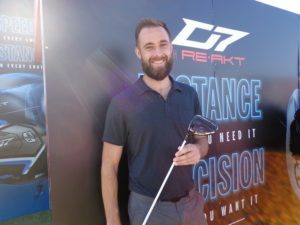 Peakvision a newer company in the world of sunglasses, had CEO Davis Feaser at the show, I am finding that they are a great design and feel great on and off the golf course. See peakvision.com for more details.